Many people have experienced the effects of bat droppings. Frequently signs of bats may be seen in your attic or other areas that contain rafters. The best way to tell if you have an infestation of bats is by examining their droppings. Throughout this article we will examine all you need to know about bat infestation, specifically the feces they expel from their bodies. The best way to determine whether the infestation within your house is due to another rodent or a bat is by examining their droppings. At first appearance, droppings from a bat are relatively long and appear in segments. They are not small, round and hard like droppings from other common household rodents. Use an object to crush the droppings to see what happens. If they delicate and powder-like, the chances are you are dealing with a bat infestation. It is also easy to see if the droppings appear to have other, smaller insects located within; however, generally this is not necessary since the first method tends to be relatively successful. Finally, bats do not generally move from place to place while expelling the feces from their body; instead, these dropping are likely to appear in piles on the ground (generally under areas with rafters present above). It is essential to understand that bat droppings are likely to lead to a few different health issues; therefore, extermination is essential. These droppings, generally found in attics, can be infested with fungus. By inhaling the spores that are in the air near these droppings, Histoplasmosis may occur. This fungal infection is relatively mild sometimes without the infected person experiencing any symptoms at all. However, those that do experience complications will have mild flu-like symptoms. Although it is highly unlikely, severe cases may lead to everything from pneumonia to high fevers and possibly death if not caught and treated. 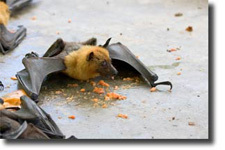 Another disease that is frequently carried by bats is rabies. Therefore, be sure to remove bats (even ones that appear dead) with a shovel or another object instead of touching them with your hands. Any bat being handled has a high likelihood of biting the handler. Anyone finding a bat or noticing a bat infestation should be sure to contact a nearby animal control officer or health department to assist with eliminating your bat infestations. Note that if someone is bitten by a bat it is important to take the captured bat in for inspection to see if it has any diseases that may have been transferred to the victim. Finally, these bats are likely to carry a variety of different parasites and creatures with them into your home. Often times when you can keep bats and birds from being near your house, these parasites, mites, etc. are likely to die off and not spread. When cleaning bat droppings be sure to use a mask as well as soap and water. Most people also recommend using at least 10% bleach when cleaning these droppings. If you find a lot of droppings from birds or bats, be sure to contact someone to assist you with the issue. Trying to handle the problem alone can be relatively detrimental to your health, even if the odds are not extremely high. Although a bat infestation may seem relatively insignificant in the grand scheme of things, note that there are health risks associated with being near these creatures as well as bat droppings. Anyone finding droppings that are long and delicate should contact someone within the city to identify and exterminate the issue. Be sure to wear a mask if you attempt to clean these droppings, use soapy water, and add bleach for best results. However, it is always best to contact a professional that is used to handling these types of situations.